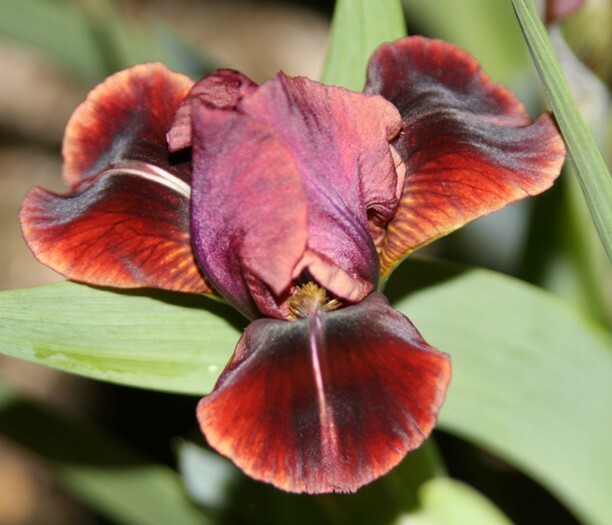 'Dragon Flamedart' (Anita Moran, R. 2011) Seedling #07MDcc02. MDB 7" (18 cm). Late midseason to late bloom. Standards wine, lighter toward edge, red-violet midrib; style arms pale yellow, crest burnt orange; Falls red-orange darkening to black near center, irregular yellow edge; beard burnt gold, hairs pale-violet base, tips burnt gold; slight fragrance. 'Minidragon' X 'Candy Corn'. Snowpeak 2013.
jpg BHP_5802-X2_dragon_flamedart.jpg manage 103 K 11 Feb 2016 - 20:04 BrockHeilman Please contact Brock Heilman for image use. jpg DragonFlamedart4.jpg manage 37 K 10 Sep 2018 - 19:48 Main.TLaurin Photo by South Jersey Iris.